Michael, Michael and Brian debate the finer points of which books to read where, and where in that spectrum Tad Williams' magnum opus works fit in. Are his books too heavy to take on a plane trip? Discuss. The guys also talk about some pitfalls you can encounter when searching for reading materials, and things writers may want to avoid in a "Book 2 of" situation. 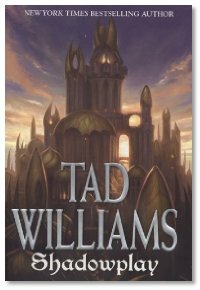 Interview: Michael, Brian and Michael talk with acclaimed fantasy author Tad Williams, whose latest novel Shadowplay (Book 2 of Shadowmarch) hit bookstores on March 6, 2007. Amusingly enough, most of the discussion is focused on Tad's work on and approach to comic books. He's currently writing for Marvel's DC's Aquaman, and the first issue of his run hit stores March 21, 2007. Good stuff. Look out for DC's lawyers! Aquaman is DC comics publication, not Marvel. Ah, crap! I can't believe I did that... Thanks for the heads up! At the beginning of this episode (I'm listening while typing) you mentioned different types of books... specifically "airplane books". Do you think that there is a market for this type of book? My story word count tends to be between 40-50K and (I've been told) read "like a movie". I've always considered my stories as something entertaining that can be consumed in one sitting... or one flight. I love Tad's books, but couldn't read Aquaman. I always found him one of the less interesting comics put out. I hope Tad brings out a newer, fresher story. BTW Mike has been mentioning wanting ideas for content. I'd love to hear lists of books done by authors that are not widely known about. Personally, I'd start with Leo Frankowski and Kevin O'Donnell, Jr. They're both fabulous and I haven't heard anyone ever mention them. Great show.